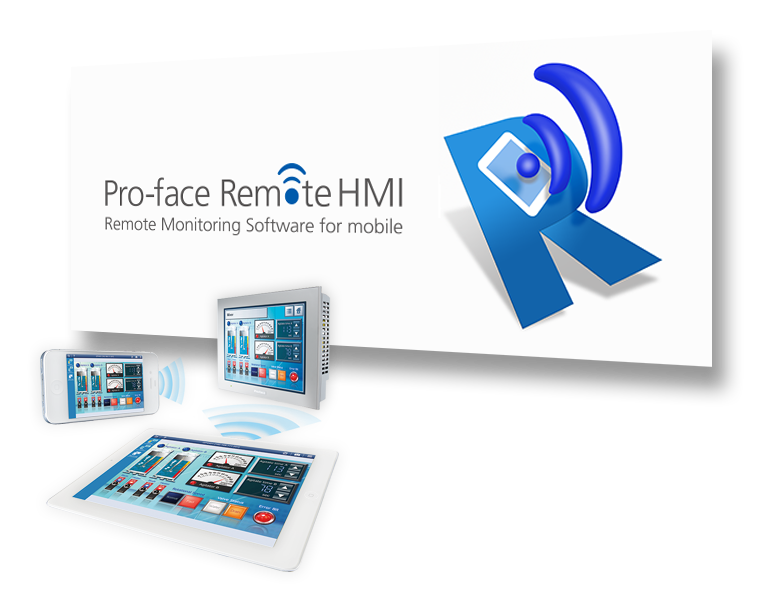 Pro-face Remote HMI is remote monitoring software for mobile and allows you to check equipment information on a tablet or smartphone. Tablet at a production site. See the new concept with Pro-face Remote HMI. "Where should I start from?" and then, see explanations in the movie. Version 1.41.000　* GP-Pro EX Ver. 4.03 or later is required. Version 1.30.000　* GP-Pro EX Ver. 4.0 or later is required. Version 1.20.000　* GP-Pro EX Ver. 3.6 or later is required. New Feature in Version 1.10.000 (compatible with iOS)　* GP-Pro EX Ver. 3.5 or later is required. It's possible to display and operate Windows applications on our industrial PC, SP5000 Open Box. *A license of Pro-face Remote HMI Server is required for use. Try Pro-face screen-creation software, data-collection software, monitoring software and so on before purchase. WinGP and Pro-face Remote HMI Server are included in the disk 2 of GP-Pro EX. For more technical information, please see the Pro-face Remote HMI Q&A.